I got my period yesterday, and along with it, the cravings for a classic New England tuna melt. 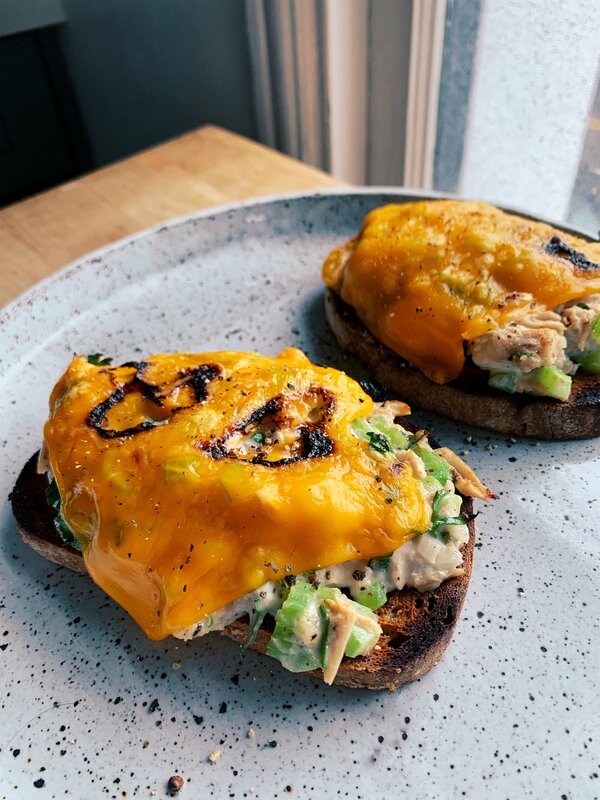 It’s a rainy week here in Los Angeles, and there was something about a crispy, butter-y, gooey salty crunchy tuna melt that was just calling my name. Cool, damp weather pairs so well with warm, crusty sandwiches. This classic sandwich reminds me of my youth. Allow me to explain. When I was 16, I played on my high school field hockey team. After practice, my friends and I would drive 15 minutes to this deli called Lucy’s and get tuna melts. Many delis sold tuna melts, but there was something in the way Lucy’s built theirs that was worth the drive. First of all, the sandwiches were the size of a human head. They buttered their ciabatta bread to the fullest extent, added layers of pillowy tuna salad and meltable cheese. Then they’d press the whole thing in their panini machines. No fancy avocado or tomato added. These sandwiches were so good. I can’t really comprehend. We’d sometimes order 2 and eat one the next day on the way to games. The older field hockey players would complain whenever we’d eat our tuna melts on the bus, as the sandwiches would stink it up. In retrospect, I feel sorry we put our senior field hockey players through it, but relish in the fact that I can now make a tuna sandwich in my own apartment without bugging anybody. Plus, the way I prepped this, there was no stinky tuna smell in sight. Eat your sandwich open faced, or close it. I made my version without a panini maker. I used my oven’s broiler. You can also use a toaster oven, if you have one! My version is gluten free and dairy free, without compromising the melty-goodness that a classic melt provides. I used this vegan mayo and this vegan cheese. If you’re vegan, swap the tuna for 1/2 cup chickpeas. The finished product is a sandwich that satisfies all my cravings. It was filling, fun to eat, and just delicious. I’m sharing my version with you so when the craving strikes, you too can satisfy it at home without a panini maker. Drain + rinse tuna. Mix the tuna with vegainase, red wine vinegar, salt, pepper, celery, onion, parsley. Spend a minute or 2 smashing everything together with a fork. Lightly toast your bread in a toaster oven until slightly browned. Don’t overtotast as you will be putting it under the broiler. Spread ghee over your 2 slices of bread. 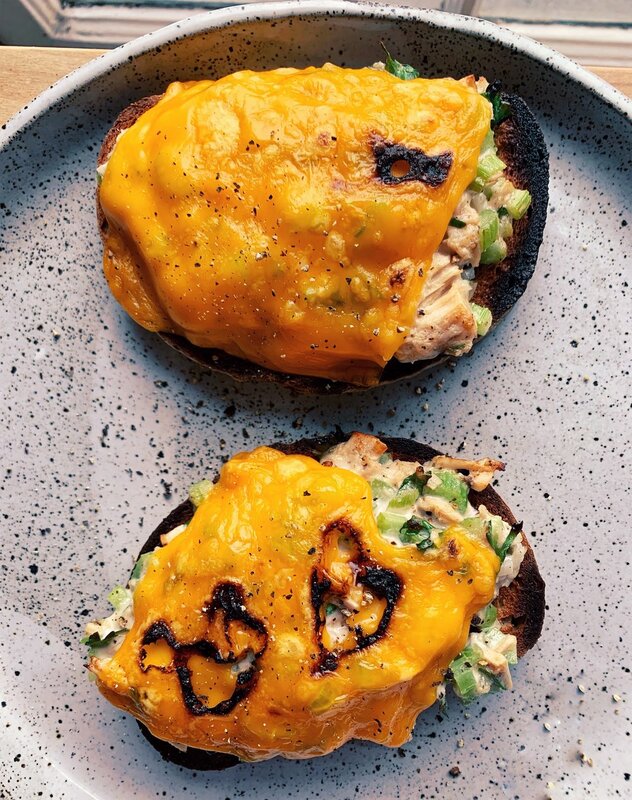 Build an open faced sandwich: top each slice with spoonfuls of tuna, spreading evenly over the tops. Add a slice of cheese to each slice of bread. Place under a broiler/toaster oven for about 1 minute, or until cheese melts. Watch carefully, you do not want to burn! Eat open faced or smash the pieces together to create a sandwich. Welcome to heaven.